The roof strategy has been different in the three main sections of the project. 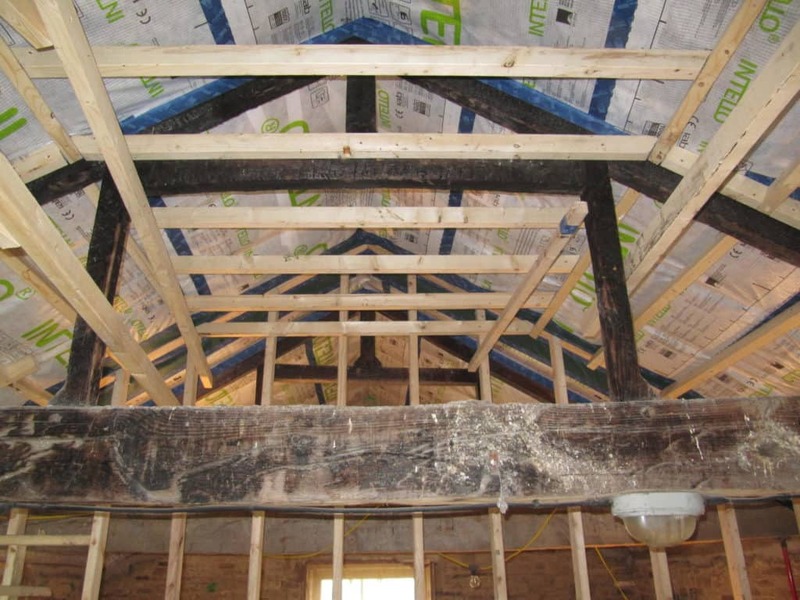 The newbuild garden room section has a warm cathedral roof with timber I-beams, following the strategy we employed at the Golcar Passivhaus project. We have also installed 5 Fakro quadruple-glazed rooflights at various locations to fit in with the existing roof timbering. 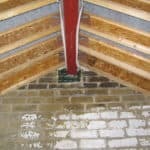 The barn roof had been restored in 2002 with a modern vapour-open sarking felt so did not need replacing. 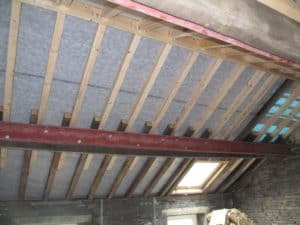 However all internal insulation and airtightness detailing followed that of the Farmhouse roof as detailed above. 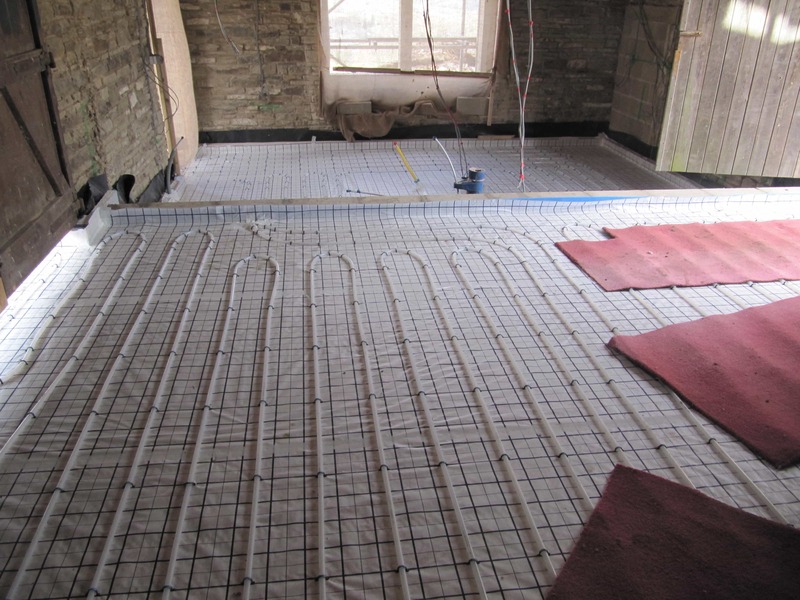 The projected heating load for the project is 4.6 kW for the whole house. In line with our usual fabric first approach, we are putting most efforts into reducing the energy demands of the building first. 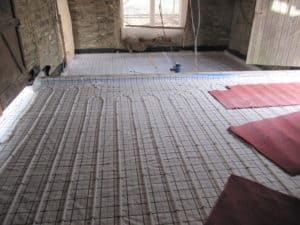 We were lucky that the project was connected to mains gas and so we are using a Vaillant EcoTec gas boiler feeding into underfloor heating on the ground floor and minimal radiators on the first floor. 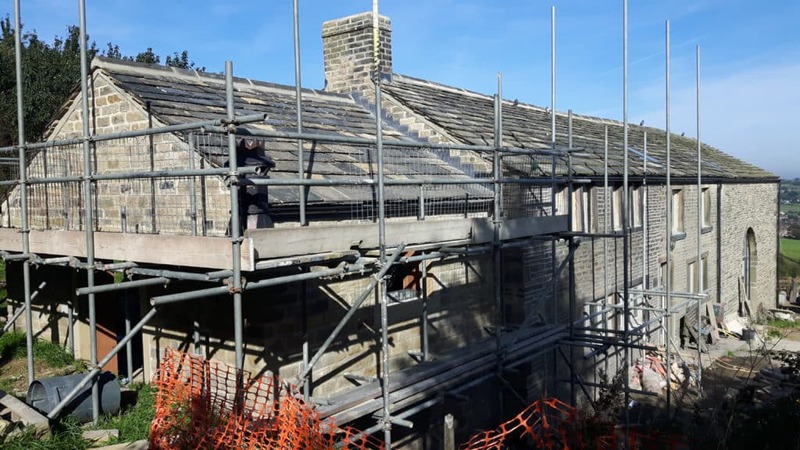 As at Stirley Farm, the heating system is well over-sized for the requirements of the building so should only be required minimally. 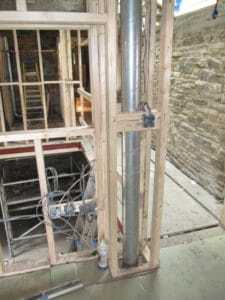 There is one room thermostat control for the whole building because it is so open plan and the Passivhaus methodology used at the project will ensure constant temperatures throughout the house. The clients were also keen to have a wood burning stove, so we have installed a Passivhaus-friendly wood stove (the Rika Vitra model), which has also been used at the Meeting House Lane Passivhaus in York). The stove has a heat output of 4kW, which almost meets the heating requirements of the whole whose if in use. We don’t think the stove will cause the house to overheat as it is a large building and it will simply trigger the room stat to turn other heating off. We have chosen the PAUL Novus 300 MVHR unit with rigid steel ducting at the project. 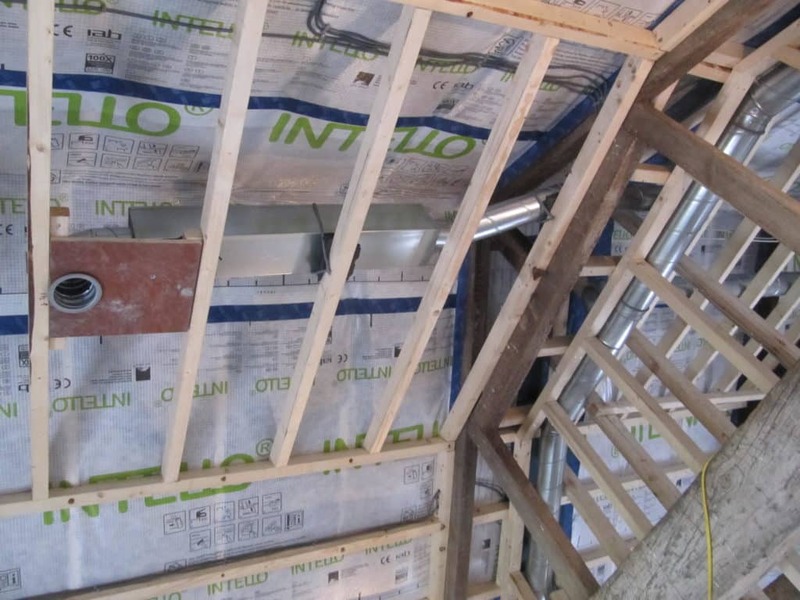 As is often the case in retrofits, the routing of the ducting can be difficult due to traditional solid timber joists presenting physical barriers, another challenge is fitting the equipment in as the buildings were not originally designed with MVHR in mind. In this case we have put the main route of ducting along the apex of the roof which is boxed in with a false ceiling. The clients originally wanted the timbers on the apex revealed but this was a necessary compromise to house the ducting. 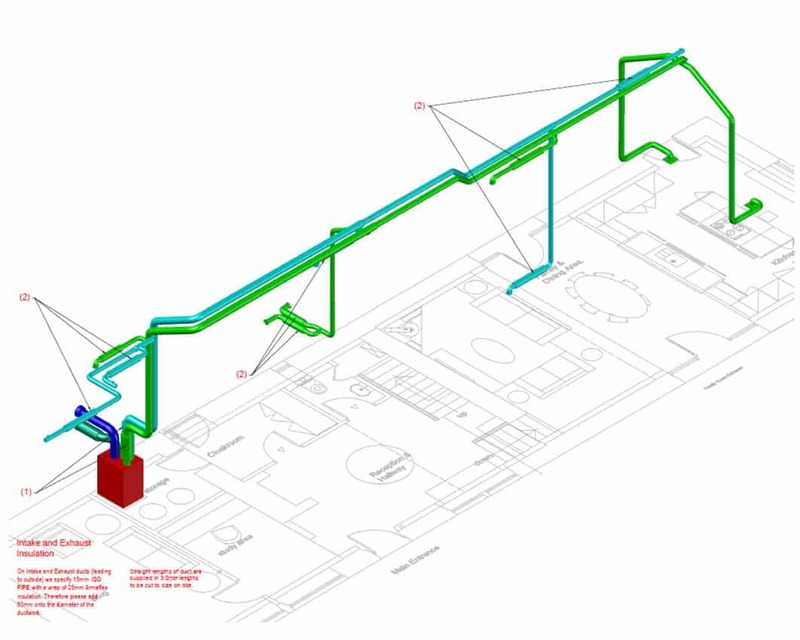 The ducting system is laid out in a root and branch design with (boxed in) ducting branches dropping down to the first floor joist zone at four locations. 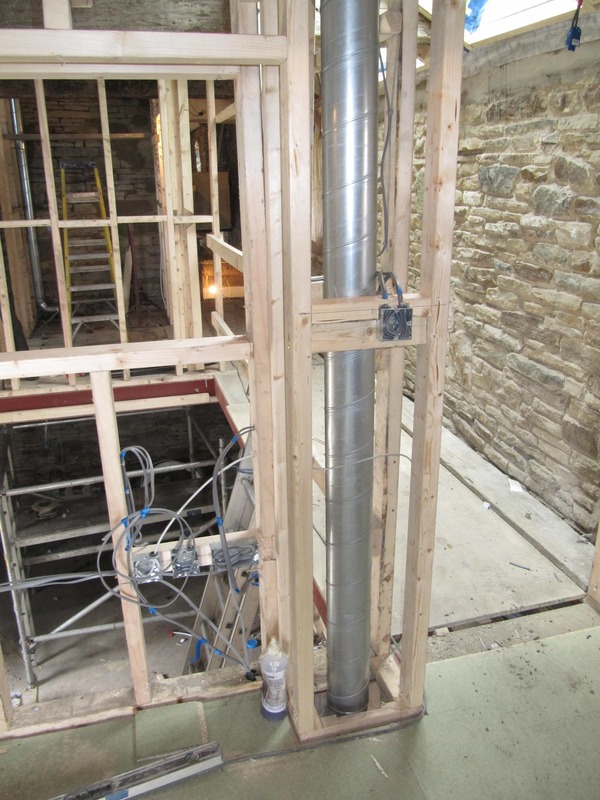 We always recommend the use of rigid ducting systems where possible, even in retrofits. The internal face of the ducting is smooth and has a lower resistance than most other ducting types therefore a lower pressure drop. The rigid steel ducting also offers greater longevity over other ducting types, as outlined in a recent CIBSE report. Because the layout of the house is quite open plan we are able to utilise the ‘cascade ventilation system’ which meant that we did not need to put air valves delivering air into every room as the air transfer route through the house would ensure good air quality. 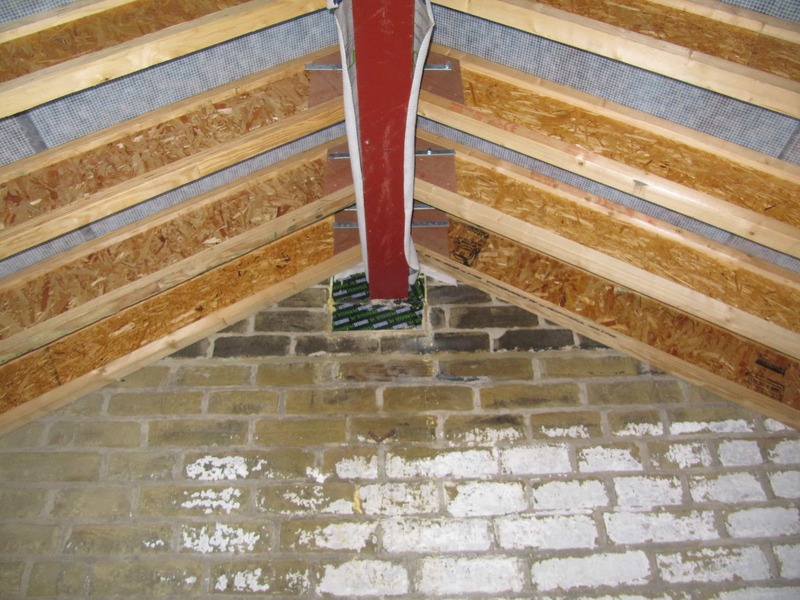 The external intake/ exhaust grilles for the MVHR system are located on the west elevation of the property, which helps prevent overheating in the summer months and improves the effectiveness of the MVHR’s summer by-pass mode. If they were on the South elevation the sun would be shining directly on them when it is at its hottest, meaning we would be bringing in warm air. The form factor on the building is really challenging – it is a very long and thin building. We’re still working out whether we can go for the EnerPHit standard (via the component method) or some other certification such as the CarbonLite retrofit standard. We are going to make the final call on this after the final fit air pressure test. Intelligent vapour check and airtight membrane from Pro Clima.